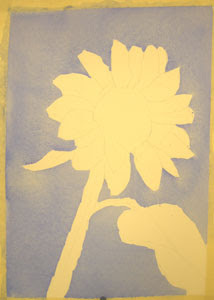 This sunflower painting has become a fun project that I bring in on a regular basis for my beginning students. It has all the essential element s of how to build a watercolor painting, including washes, glazing and brush work. 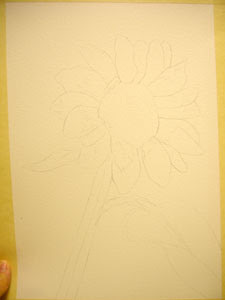 I begin by transferring my drawing to my watercolor paper. I like to use Arches. It is a wonderful, durable paper that holds the color well. I then, tape the drawing to a foam core board with two-inch masking tape. This holds it in place as I paint the wet washes, and will pull it back to a flat state as it dries. Be sure to cover at least 1/2 inch of the paper with your tape. If the tape doesn't have a good grip, the paper will pull out when it gets wet. The next step is to float a big, juicy wash of French Ultramarine Blue around the outside edge. Be sure not to outline or get ahead of the wash. If you want a smooth wash, paint wet, create a bead of paint flowing toward the direction of the next stroke. To keep the bead in the right place, tip your paper slightly. To learn more about how to create a beautiful flat wash, you can get my Beginner's Watercolor Workshop DVD at http://watercolorworksart.com/Classes. The DVD is $27.00, plus $3.00 shipping and handling. It contains over an hour of instruction, plus you can put the disk into your computer and print the 20-page workbook.